Located in gthe township of Weathersfield Vermont, Rockledge Farm Woodworks is family-owned and operated, producing from native hardwoods and burls a wide range of hand made wood products. Our family first homesteaded farms in this area in the late 1700’s, settling variously in the local towns of Reading, Brownsville, Hartland and Weathersfield, where many descendents remain to this day. Our own “branch” of this family left Vermont in the mid-1800’s for Massachusetts, and eventually New York and New Jersey. In the 1930’s the great-great-grandparents of the now youngest generation here, returned from New York to their Vermont roots, purchasing Rockledge Farm. Shortly after moving back, the family began a mail-order business selling products made locally and here at the farm, including simple wood furniture as well as jams and marmalades, and soapstone cookware, all under the Rockledge Farm name. In the 1940’s they acquired a water-powered Grist Mill located just up the road in Reading Village, eventually milling and marketing Rockledge Farm Stone Ground Wheat Flour. RockledgeFarm was originally a subsistence farm producing sufficient food for the family, and earning additional income from breeding horses. The first home and barns were built in the early 1800’s, and in typical Vermont fashion were much added on to over the years. The barn is actually comprised of 7 separate but connected buildings, some built on-site, with others moved to their present location. The home was similarly a single story cape, which was eventually raised a story and a new ground floor built under the old home. Two more small buildings were added to the home, including one that was originally the local Stoecklin District one room school house located across the state highway from Rockledge Farm, and moved here over a century ago when the district schools were discontinued. Our family has now converted much of the barn space to workshops, wood storage, and showroom for our furniture and woodenware. Today we craft a wide selection of furniture and gifts in the finest hardwoods and burls native to this area. 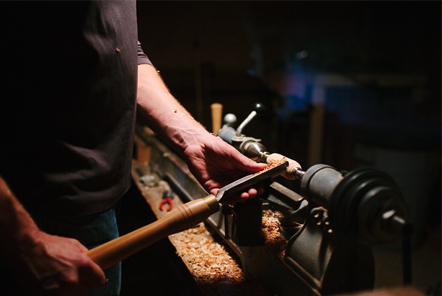 For us as woodworkers, first and foremost is the quality and beauty of the wood we use. Visit us here at the farm, on the web, or in select galleries in New England and beyond to see our Salad Bowls turned from solid blocks of uniquely grained Cherry, our Carriers with intricately figured Birdseye Maple, our single plank Cutting/Serving boards made from figured woods, our Food Serving Utensils carved in Cherry Heartwood, and of course our one-of-a-kind and custom furniture. We use woods which we know have been harvested in a responsible, sustainable manner. Our functional designs are carefully fashioned using time-proven methods, producing items that can be enjoyed and used for generations.